Greenwich’s Genevieve DeWinter runs to a first place finish in the 600 at the Class LL championship on Saturday. NEW HAVEN — All the Greenwich Cardinals could do was hope Saturday’s first-event upset wasn’t a harbinger of things to come. The Cardinals bounced back from losing the girls 4×200 relay to win the very next event, the 4×800 relay, kicking off a day that ended with the Class LL state championship. Greenwich finished the day with 88.5 points to pull away from runner-up Danbury’s 71 over the final three events. Fairfield Ludlowe came in third (56) with Glastonbury (41) and Brien McMahon rounding out the top five. It was the first-ever state indoor championship for Greenwich. Heading into the Sprint medley relay, Danbury had 49 points and was in front of both Fairfield Ludlowe (48) and Greenwich (44). Greenwich — behind the team of Olivia Caan, Maggie O’Gorman, Zoe Harris and Emily Philippides — won the event in 4:19.3, to cut the Hatters’ lead to just one. It was Greenwich’s second straight relay win (also won the 4×800) after placing second in the 4×200 to open the morning. While neither team got any points from the 300, Olivia DiLascia’s fifth-place finish in the high jump gave the Cardinals a point and a half and put them into the lead. 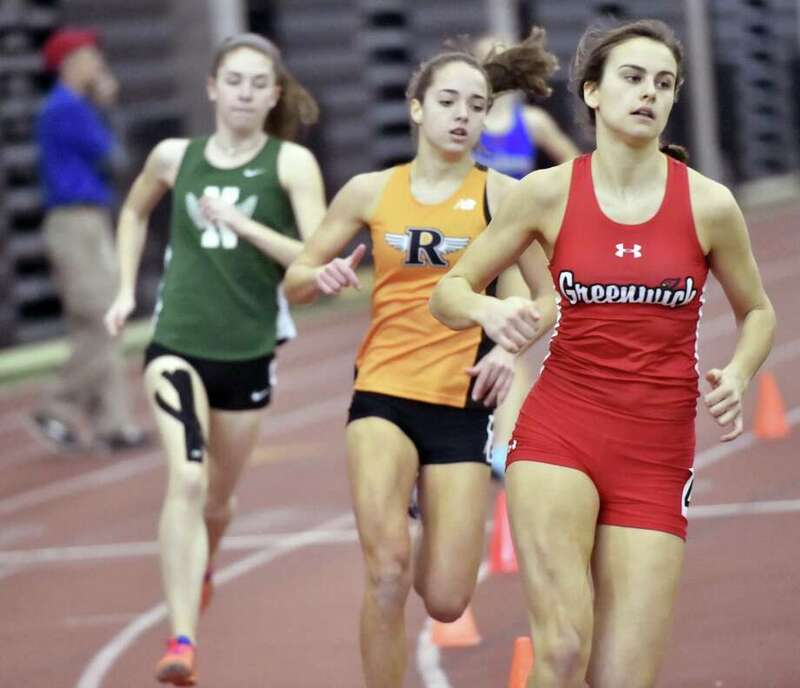 The Cardinals picked up two more points in the 3,200 as Hetty McMillan, Caroline Webb and Meghan Lynch went 3-4-5 to garner 12 points against Danbury’s 10 from race winner Lauren Moore (11:13.35). Greenwich added eight more points during the pole vault as Lia Zavattaro finished second with 11 points and then the 4×400 relay put the finishing touches on the title. Harris and Philippides joined Genevieve DeWinter and Jordan Numme to win the event in 4:02.45, ahead of third-place Danbury (4:07.29). Danbury coach Nick Fraticelli admitted Greenwich had all the Cards to walk away as a championship team. Earlier in the meet, after the shocking finish of the 4×200, Greenwich’s 4×8 squad quickly righted the ship by winning in 9:27.30 behind Lynch, McMillan, Harris and DeWinter. Philippides then followed with her 1,000 win to really get the ball going for the Cardinals. DeWinter also won the 600 and Lynch placed third in the 1,600 as Greenwich and Danbury went back and forth with the lead through the first 10 events. With every single point counting, the Cardinals kept digging and piling them up to their first title.